Kryptane urethane sheets are available in standard 4’x8′, 4’x10′, 5’x8′ and 5’x10′ sizes from 1/8″ to 1″ thick. Sheets can be made in plain, fabric backed, expanded metal backed, solid metal backed, and weldable configurations. Options for installation include adhesive, welding and a variety of common fasteners. Argonics also offers Kryptane urethane-capped bolts that can be used in conjunction with our universal counterbore tool. 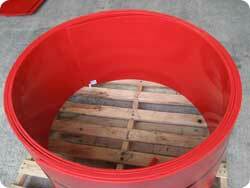 Custom liners are available for quotation, made to the dimensions of your chute, bin or hopper. 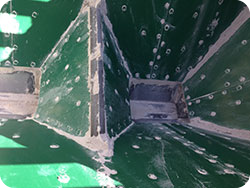 Our custom liners can save you hours of labor usually spent cutting and fitting sheets in the field. Kryptane® urethane liners are also available in 4- and 5-foot wide rolls, with lengths of 25, 50, 75 and 100 feet. Backings available are plain (25′ and 50′) and fabric, with thicknesses from 3/16″ to 1″.